I left the camp with the guide,Charlie, about midnight. There was a hail storm last night from about 10 pm until 11, thankfully it quit about 11:30. The wind was blowing about 20 to 30 mph but the guide said that was usual. 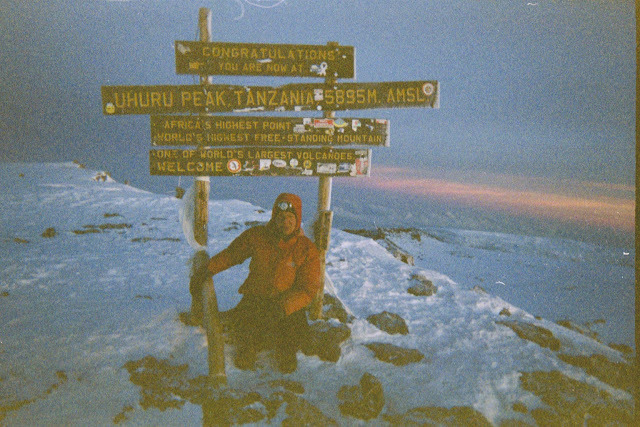 We started at 4600 meters and have to make it to Uhuru Point which is 5895 meters. So we have about 4000 feet to climb in the freezing cold at night with 30 mph winds. About half the way up we ran into two young guys who said the altitude got to them and they did not summit. Not the most encouraging of news. Every few steps I would want to rest but Charlie would tell me to keep putting my feet in front of me. My eyes were hurting so bad due to the cold and wind. We had headlamps on due to the darkness but Charlie told me to put on my sunglasses to keep out the wind. So strange to be wearing sunglasses at night. But it helped. I realized that I was taking 2 breaths to every step. 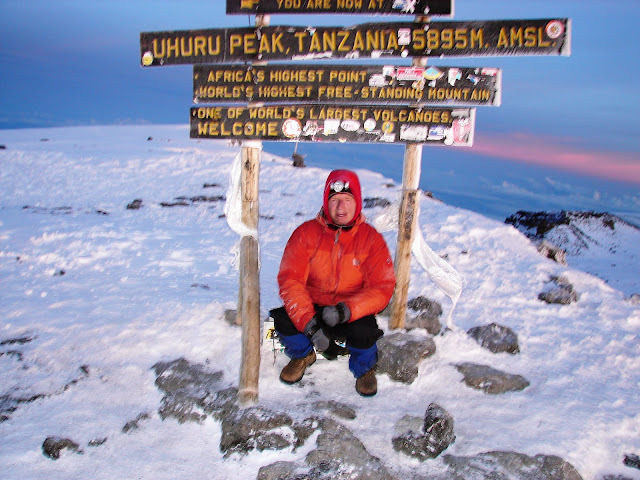 What was I thinking when I decided to climb Kilimanjaro. Whenever I thought about quitting, I thought of Gunther, the German who was making his 3rd climb. He was 80 years old and summited one day ahead of us tying the age record. Leaving at midnight accomplishes two purposes, the ground is still frozen and easier to climb and you arrive at the summit at daylight which is incredibly beautiful. Pole.Pole. Which is Swahili for slowly, slowly. 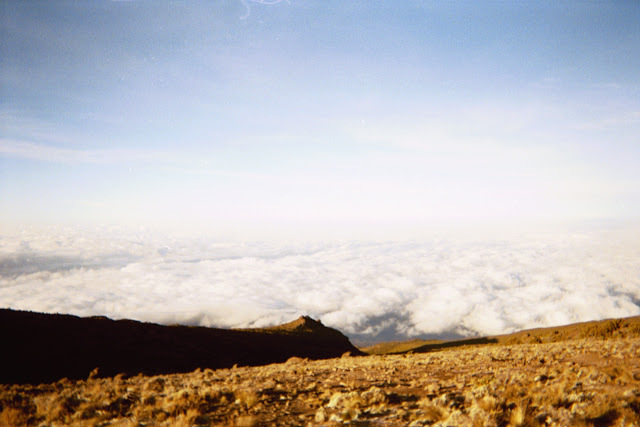 That is the secret for climbing Kili. After about 5 hours we arrived at Stella Point. My guide said that many people stopped here and considered this their summit. He said it was another 60-70 minutes to Uhuru Point. I told him that I did not climb all this way to stop before the top. I saw my climbing friends , Rob and Caleb, who left without me because they thought I would slow them down, coming down the mountain. They were unhappy because they summited too early and it was too cold to wait for sunrise. I finally made it to the summit and arrived as the sun was coming up. I was the only one there at the time. Charlie took a few pictures and my batteries quit working due to the cold. Luckily I brought a cheap camera which worked fine for a few pictures. There is only 50% of the oxygen that you normally breath at that height and it was about -10 C , so your time at the top is limited. If I go back I will climb for more days and acclimate better so that I can stay on top longer. 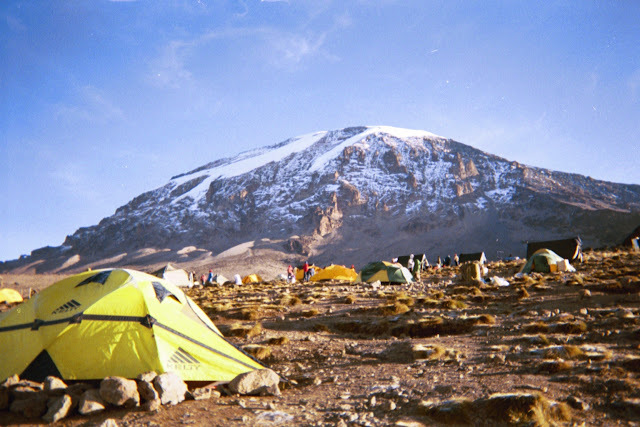 9-10 day climbs allow you to sleep right below the crater, acclimate and only have to climb about 1000 feet to summit. 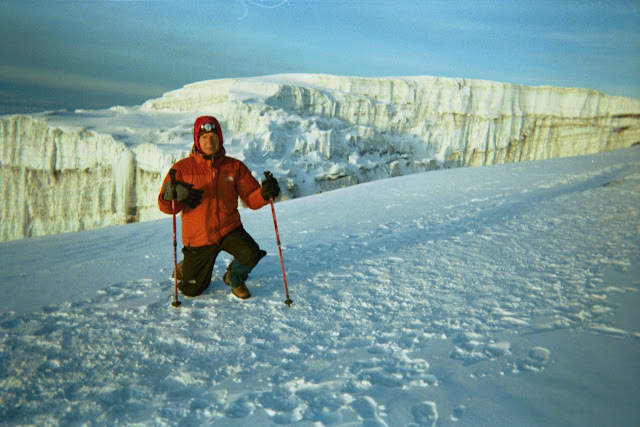 The glaciers at the top were spectacular and to be standing on the "Roof of Africa" is an unbelievable feeling. But now you have to get down. You have been climbing for 6 days and not you go down using muscles that you have not been using. Everyone goes up different routes but everyone goes down the same way. By now the sun is up and the ice on the ground is melting. You are slipping and sliding all the way down back to the camp. After several hours of walking you arrive at camp and they let you sleep for 1.5 hours. Then they pack up the camp, eat a quick lunch and you walk down for another 5 hours. We had walked up 4000 feet and down 11,000 feet in one day. We finally made it to the Mweka Hut and had a celebration beer or beers. We tipped our porters and guides who amazing carried all of our supplies up this mountain. The next day we got our certifications from the Park Ranger stating we had actually summited and went back to the hotel. Tomorrow I go on Safari. "Some people travel to look, while others come to see."